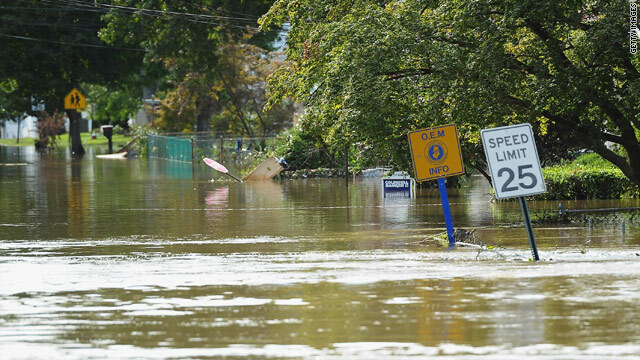 Signs stick out of a submerged neighborhood Monday in Pompton Lakes, New Jersey. Flooding emerged as a major concern Monday for states hit by Irene, which hit the East Coast as a hurricane and then a tropical storm over three days. Officials said the storm had knocked out power to more than 4 million people and was responsible for at least 27 deaths. [Updated at 10:20 p.m.] Personnel in a state police helicopter on Monday rescued 21 people who had been stranded by post-Irene floodwaters in a Prattsville, New York, house, a local official said. The group was stranded at a house that was cut off when all the bridges near it were washed out after torrential rains flooded homes and businesses and left the Catskill Mountains town of Prattsville largely cut off from the outside world. Emergency workers rescued 87 people from the Prattsville area a day earlier, including 25 people who were stranded at a motel for hours after 70 mph wind gusts grounded aircraft. [Updated at 7:32 p.m.] Vermont's governor warns that further flooding and loss of life related to Irene are likely for his state. Although small brooks have crested, large rivers have not, he said. 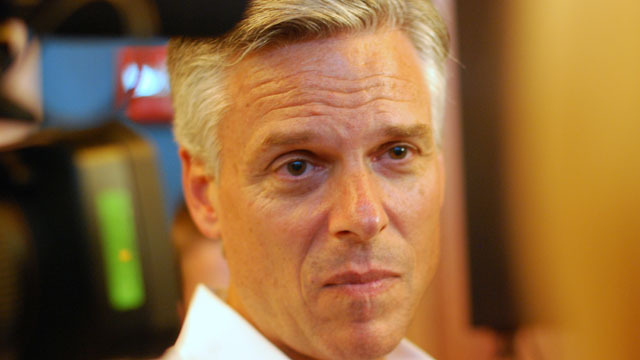 "It's just devastating," Gov. Peter Shumlin said. "Whole communities under water, businesses, homes, obviously roads and bridges, rail transportation infrastructure. We've lost farmers' crops," he said. "We're tough folks up here but Irene ... really hit us hard." Three people are reported to have died in Vermont as a result of the storm. The nation's death toll from Irene is at 27. A jury earlier this month sentenced polygamist leader Warren Jeffs to life in prison for sexual assault. [Updated, 7:50 p.m. 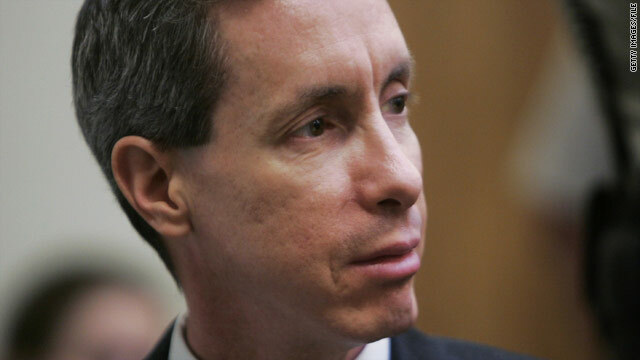 ET] A source familiar with the medical condition of polygamist leader Warren Jeffs' medical condition told CNN Monday that Jeffs was in a coma. The source did not provide further details. The source's information came after Texas prison officials said Jeffs was in critical condition at a hospital following a fast. [Initial post, 1:07 p.m. ET] Polygamist leader Warren Jeffs was in critical condition in a Texas hospital Monday after falling ill during a fast, state prison officials said. The leader of the Fundamentalist Church of Jesus Christ of Latter-day Saints, a breakaway Mormon sect, was sentenced to life plus 20 years in early August after being convicted of sexually assaulting two girls he claimed were his "spiritual wives." Jason Clark, a spokesman for the Texas Department of Criminal Justice, said Jeffs was sent to a hospital in Tyler on Sunday night and was in critical but stable condition Monday. "He was not eating or drinking enough fluids and also has some other medical conditions," Clark said without elaborating, citing inmate privacy rules. Jeffs told prison officials he was not on a hunger strike but that he had been "fasting," Clark said. Filed under: Crime • Texas • U.S.
Overheard on CNN.com: Was Gaga awesome or over the top? What's the deal with Gaga's alter ego? Way to steal the show, Beyonce! Ladies may have walked off with most of the awards at this year's MTV VMAs, but it was Lady (make that "Lad") Gaga and Beyonce with Baby who apparently stole the show. Lady Gaga's act as alter ego "Joe Calderone" entertained or annoyed CNN.com readers, while many were equally charmed or annoyed by Beyonce's baby announcement. carnac95 said, "Lady Ga Ga seems to have stopped focusing on her music: It's all about shock factor at this point." Peace said, "My first thought, 'Karate kid has an evil twin'? HaHa!" San Jose said, "She is a performer! An entertainer! And I was definitely entertained. It would be annoying if she couldn't back any of her acts with actual talent, but she has a really amazing voice. Gaga is extremely creative and talented, and I can't wait to see what she comes up with next!" But Guest disagreed: "I really wish Gaga would cut the antics. She can play the heck out of a piano and can sing her booty off. I'd like to focus on that rather than get distracted by the ridiculous costumes, and what I guess you would call her 'stunts.' It would be a shame to see her become a cliche of herself." Many said that Lady Gaga's impersonation had been done first by Annie Lennox. praxisjg3 said, "Although Gaga is shaking things up and keeping things interesting, at times, she took the Annie Lennox 84 Grammy performance concept and just twisted it into her 2011 version." PaKyes said, "I was hoping someone would remember. Lady Gaga was not the first to do this!" teddy said, "Gaga is a disturbed individual. Yes, Annie Lennox and Madonna did do these types of performances at the VMA's, yet they were done with more class, professionalism, meaning and artistic credibility. This Gaga guy (or girl) is just gross, boring, untalented and, obviously, insane. I see nothing authentic about Gaga." Khamis Gadhafi, a son of Libyan leader Moammar Gadhafi, was killed in a battle Sunday night with opposition forces, a senior rebel commander told CNN on Monday. Mahdi al-Harati - the vice chairman of the rebel's Miltary Council, the military wing of the National Transitional Council - said that Khamis Gadhafi died in a battle with rebel forces between the villages of Tarunah and Bani Walid. The battleground is in northwest Libya, near Misrata. Khamis Gadhafi, who was a senior military commander under his father, was taken to a hospital where he died from his injuries, said al-Harati. 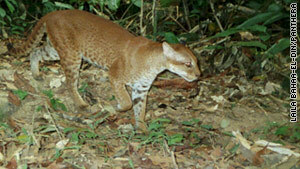 He was then buried in the area by rebel forces, according to the rebel commander. 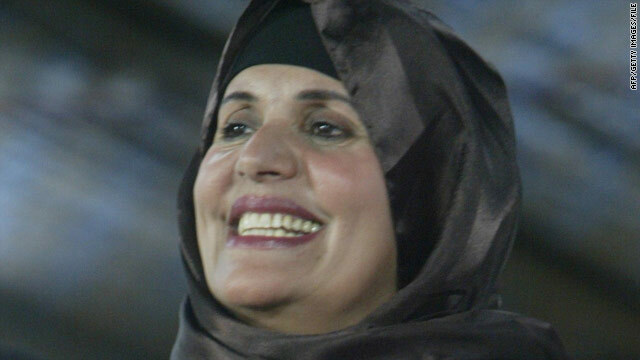 Moammar Gadhafi's wide, Safia, pictured in 2003, arrived in Algeria on Monday with three of her children, Algeria says. The wife and three children of Moammar Gadhafi are in Algeria, that nation's Foreign Ministry said Monday. His wife Safia, his daughter Aisha and two of his sons, Hannibal and Mohamed, came to Algeria via the Libyan border. 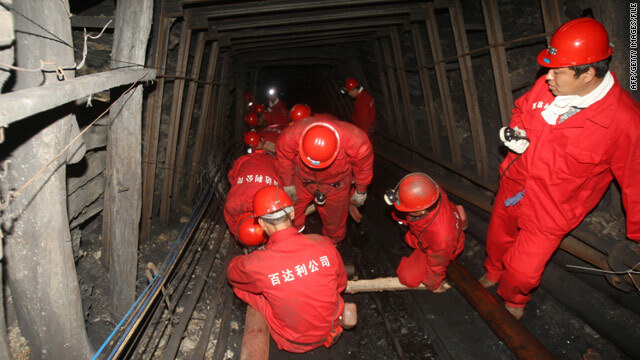 U.N. and National Transitional Council officials were informed of the development, the ministry said. Aisha, a former U.N. goodwill ambassador who has kept a low profile during Libya's violent uprising, is due to give birth in early September, sources close to her family said. 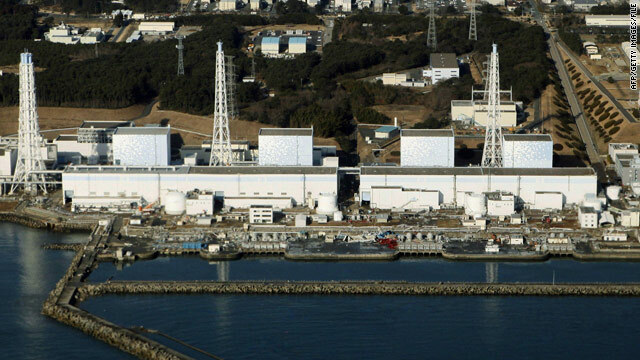 Tens of thousands of residents were evacuated after an earthquake damaged Fukushima nuclear power plant in March. An environmental group on Monday urged the incoming Japanese prime minister to delay the start of school near a nuclear plant crippled by a massive earthquake and tsunami six months ago. Fukushima city schools are scheduled to reopen Thursday. The March 11 disaster triggered the worst nuclear crisis since Chernobyl, as cores overheated and spewed radioactive material into surrounding areas. Greenpeace said the government's decontamination plan is lacking, adding that its team found average radiation doses remained high in areas decontaminated by the government. 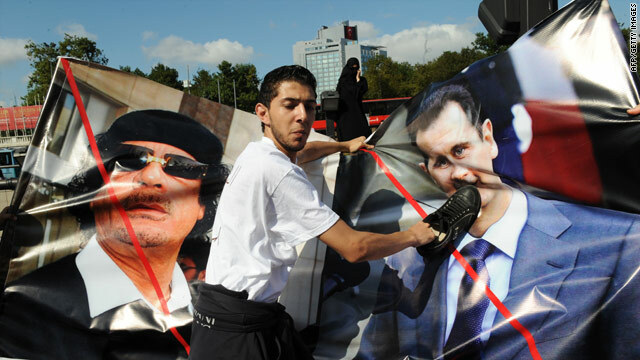 Protesters denounced Bashar al-Assad and Moammar Gadhafi during Sunday demonstrations in Istanbul, Turkey. Syria's ferocious crackdown against demonstrators persisted on Monday, but its tough actions against civilians are shattering its once-close relations with neighboring Turkey. Turkish President Abdullah Gul said his country has "lost its confidence" in Syria's Bashar al-Assad regime, the latest setback for the much-reviled Arab government. Military and security forces Monday stormed the town of Sarmin, in northwestern Idlib province, said the Syrian Observatory for Human Rights, an activist group with a network of contacts across the country. Five people died, including a child, and more than 60 people were wounded. Dozens of people have been arrested, they observatory said. A massive landslide swallowed homes in eastern Uganda early Monday, killing at least 23 people, the Red Cross said. 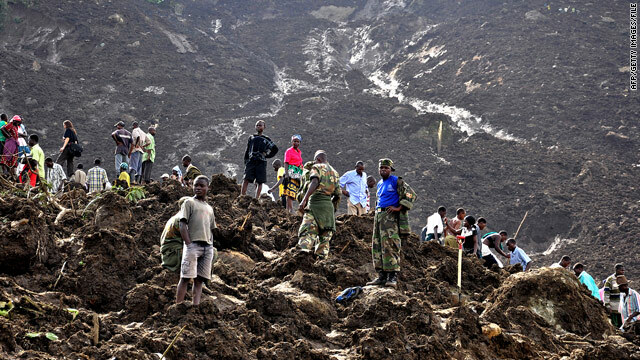 Torrential rains triggered the landslide, Red Cross spokeswoman Catherine Ntabadde said by phone from the scene. Two people have been rescued, but the death toll is expected to rise as rescue crews scour through the site in Bulambuli district. Bulambuli district is about 300 kilometers northeast of the capital, Kampala. At least 106 people were killed during a landslide last year in Uganda's Bududa district (pictured). Hurricane Irene may have come and gone, but residents up and down the U.S. East Coast must now deal with the storm's aftermath. Watch CNN.com Live for continuing coverage of Irene's aftermath. 10:00 am ET - International space station briefing - The international space station program manager will update the status of the station following last week’s failure of a Russian cargo vehicle to reach orbit.